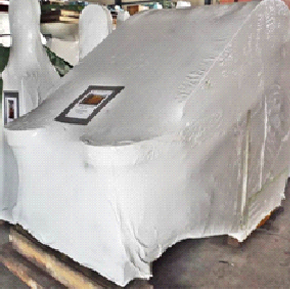 Crystal Offshore is involved in various heavy-lift haulage and project cargo movement. We have a knowledgeable team of staffs with more than 20 years experience in move and transporting heavy-lift cargo around Asia. Our technical and operations team is able to provide a viable and cost effective solution for all your heavy-lift cargo haulage.We also undertake turnkey project management for heavy-lift rolling / skidding operations which covers marine transportation by heavy-lift Carrier / Barges. Our technical and equipment knowledge allow us to provide the client a single source of contact with a price advantage in their heavy-lift haulage and transfer. Provide fully comprehensive procurement and supply services to our customers. Our Procurement division are drawn from specialized fields with each having a unique equipment and product knowledge which enables a faster response to client requirements with the addition of specialist technical support whenever needed.Our principle is to deliver quality products and service excellence at the most competitive price through our experience, integrity and overall ability by utilizing our experienced personnel with knowledge covering all aspects of marine and offshore equipments and spares in conjunction with our vast network of principals worldwide. 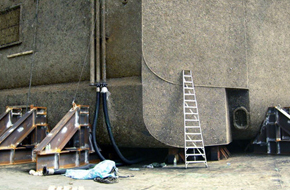 Crystal Offshore offers a wide range of marine accomodation outfitting equipments & gallery equipments custom-made as per our client's requirement. 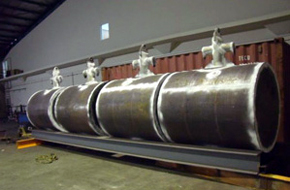 The products that we offer are of the best processing quality to ensure optimal utility.Our products are manufactured to the highest quality standards and approved by major clarification bodies such as ABS, Lloyds Register, GL, DNV, BV, NKK, EC, IRS, etc. Crystal Offshore is associated with leading manufacturers who are specialised in gallery and laundry equipments. Our company has developed a well organised department to provide technical support for its customers. Our Oil Tools division has the expertise in sales, operations and engineering that exceed your needs for oil field production and drilling products. The key difference that distinguishes us from other companies is our philosophy to provide quality products that is made in the US and Canada by providing dependable services which are competitive in the marketplace. By doing so, we are in a better position to provide more efficient, productive, and profitable solutions. 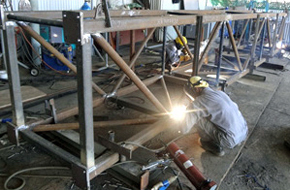 We represents various well-known manufactures and keeps stock for a wide variety of oilfield specialty products. Most of our products are interchangeable with most of the larger manufacturers in the industry. PSI MAX2000 (USA) - supports all aspects of liquid and solids control, treatment processes ranging from environmental remediation, oilfield drilling operations and uranium mining. 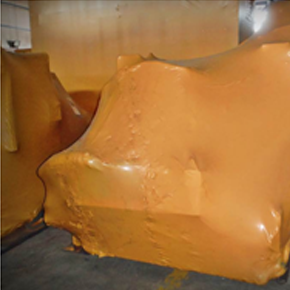 Eureka Fluid Film (USA)– Is a unique lanolin-based brand of corrosion preventive and lubricant, used Worldwide in a multitude of industries and hash offshore environment applications. DenCon Tools Co. (USA) - API 7K , API spec Q1 and API 8C Drill pipe handling tools including casing spiders, slips, elevator, Kelly bushing , master bushing, rotary adapter, safety clams and many more. Preservation and cold stacking services. 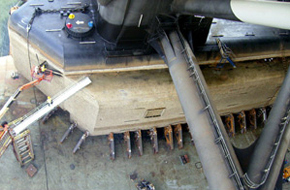 Crystal Offshore has a team of experienced preservation crew. 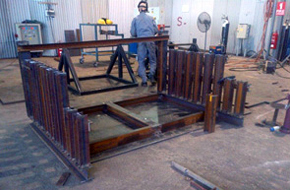 Preservation is carried out based on International Mothballing standards for Drilling Equipment for preserving all rig board equipment. 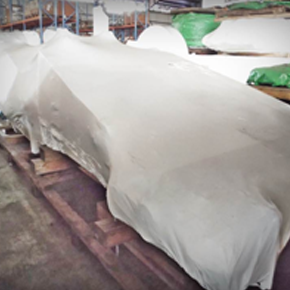 TheMothballing procedures are accepted by major marine insurance company and marine CLASS society (ABS, DNV, GL) . 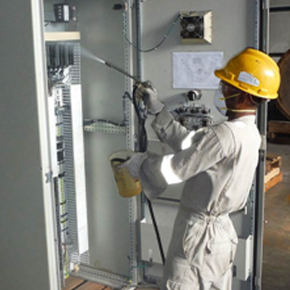 Worker spraying preservation coating - NOV TDS control panel. Iron roughneck preserved with VCI wrap and anti-rust coating. 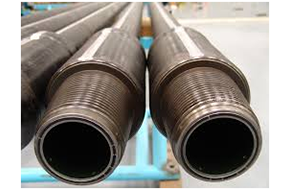 CRYSTAL OFFSHORE TECHNOLOGY PTE LTD specialized in the provision of completion and surface pressure control and down hole equipment’s and servicing oilfield equipment’s. 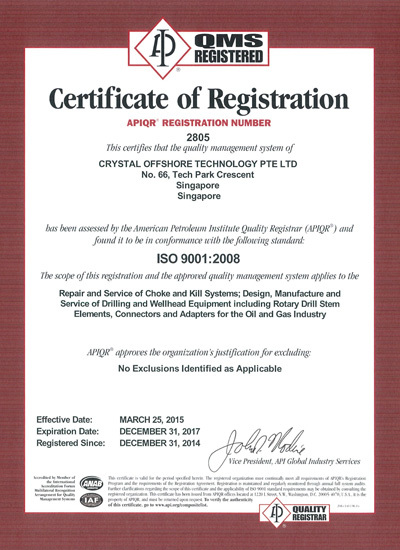 Fully Owned Subsidiary of Crystal Offshore Pte Ltd Established in 2005, the company now provides a full range of Oilfield equipment’s; Design and manufacturing repairing of surface pressure control & down hole equipment’s. Through its manufacturing, assembly and testing facility located in No.66 Tech Park Crescent. We maintain high quality and standards by keeping abreast and investing in highly advanced machine tools and technology, We are Qualified by ISO 9001:2008 and API Q1, 6A, 16C, 7-1, quality system. We are a team of capable management personnel and staff, reaffirm its customer by providing reliable, efficient and prompt services at all times.